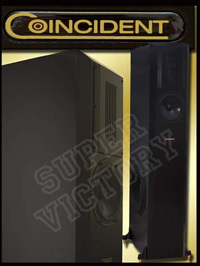 The Super Victory is a 3-way design that stands almost four feet tall, are only 9” wide but 17” deep. Each speaker weighs a robust 125 lbs. They are currently smack in the middle of a five model lineup. The Super Victory (let’s call it the SV) is essentially the same as the $15,000 Total Victory IV less one midrange and one woofer (and $5,500). The tweeter is a planar, isodynamic ribbon that roughly measures a rather large 2” wide but 6” high which translates to a very large surface area for big and wide dispersion. It is a purely resistive load at a flat 8 ohms and features very high sensitivity partly due to the use of a highly powerful neodymium magnet structure that measures 3"x6" and weighs in excess of 2 lbs. A large, solid aluminum faceplate keeps the driver rigid and under control. In the past, ribbons were pretty fragile and not conducive to high output. They were easy to blow up and a lot of them did. Blume claims that his speakers will play well in excess of 100 db and that he has had zero failures in the field. The mid is a proprietary 7 incher with a paper treated cone that was designed exclusively for use in the TV IV. It is a high sensitivity driver with an exceptionally low mass and high rigidity cone, large magnet structure and very high gauge magnesium basket and frame to reduce resonance. Heads up; Throughout the description of the SV, you will hear the word “resonance” a lot. Mr. Blume views extraneous resonances like a ground hog views an eagle; a mortal enemy. The woofer is a side-firing 12" Nomex fiber cone with a thick cast iron frame and a magnet structure that weighs in excess of 15 lbs. There are thick gauge, gold plated copper terminals to maintain high current capability. The tall, slender columns are solidly anchored by four unique and very substantial outriggers that attach tothe bottom and extend out to each side where four large and heavy solid brass cones reduce resonance and increase isolation while making sure the towers are held in place with little danger of tipping over. I was impressed with the ingenuity employed there. We never want out reviews to sound like an informercial, so it is always a question as to how much company and product info to include. In most instances, this is not an issue because the designer does not reveal a lot of his design goals even when we ask. Sometimes it's even hard to get normal specs. Perhaps they view them as some deep dark secret, which is their perogative. In this case, much info is published and the designer was very forthcoming on some of the finer points when we asked. In some cases, Mr. Blume's ideas are at odds with the mainstream speaker manufacturers. We think most of what he disclosed is informative and helpful should you want to make a buying decision. to ensure machining accuracy to within .01 %. All speaker joints are manufactured using the “Spline Joint Construction” method to produce a very tight cabinet devoid of resonances. Furniture grade cherry wood is used that is veneered inside and out to eliminate any potential for the finish to peel or bubble. 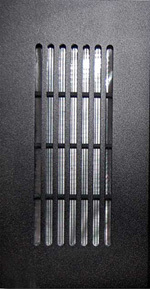 Elaborate computer designed bracing scheme which minimizes any cabinet flexing, which creates excessive storage and release of energy which results in audible distortions. 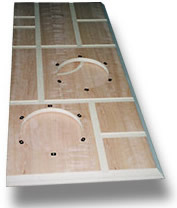 Enclosure dimensions which help reduce internal standing waves. The European drive units are manufactured specifically for Coincident and/or modified by Coincident for enhanced performance. All drivers are tested and matched to within .2 db to ensure that all speakers match the reference, thereby eliminating any unit to unit variation. Coincident adheres to the belief that only superior drivers can produce superior sound, even though this is a much more costly path to follow. All drivers are highly sensitive, have uniform impedance characteristics AND possess high power handling capability for the utmost in reliability and sonic excellence. Computer Aided Designed crossover networks that use only first order designs to ensure phase coherency and sonic purity. High gauge OFC air core inductors, precision high wattage metal oxide resistors, high voltage polypropylene (Auric Cap) capacitors all matched to within 1%, all lead to lead construction and then hand soldered for the shortest signal paths. Furthermore, since every component is hard wired, the elimination of circuit boards and terminal connectors means that there is nothing to corrode, oxidize or deteriorate over time. Only one component is in the signal path for each driver. Stated frequency response is a very broad 25 Hz to 35 kHz. Hmmm…. Perhaps more than any other speaker we have reviewed, the SV was full of unexpected results. For example, upon arrival I normally place speakers in the small (12x10x8) room for break in while I finish up reviews in the large room. The SV’s we received were one of the first pairs completed and Israel kindly put about 125 hours on them before shipping them. Still they require about 200 total hours to achieve normal levels of performance, so in the small room they went. I should say here that even though I did not hear them fresh from the box, speakers with ribbon drivers usually sound pretty raw and I would expect nothing different from these, so if you buy them don’t be surprised if that is the case. In this case, they sounded remarkably good. In fact, as they ran close to the 200 hour level, they sounded amazingly good for a large speaker in that small room. I had read in the manual that they are supposed to sound good in small rooms. THe intial reaction to that was, "Yea...right. we've heard that before", so I did not believe they would in my room. Why? I have had dozens of floorstanders with ten to twelve inch woofers in there and they have always been way too much for that small area. The low end just overpowers and overloads the room. Since they are positioned only about 6’ from the listening position, imagining is always pretty bad, too. The small room has proven time and again that it is by far best served by stand mounted bookshelf/monitor models. Frankly, I usually don’t even waste time listening more than a few minutes to large speakers in there. But a funny thing happened when I sat down for a few minutes the day they were to be transported to the other room - they sounded astonishingly good! 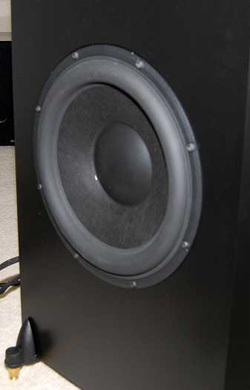 Positioned with the side-mounted woofers to the inside, bass was big, firm, low and well controlled. While it was s a bit overpronouced, it did not overload the room causing it to be boomy, overly resonant or inarticulate. It was very listenable with unusual weight and tunefulness. Imaging was spot on too, even though the tweeters were firing in close proximity in the near field. In short, the Super Victories were very much at home in close quarters. Surprise number two came when I moved them to the large room with the woofers pointed out as the manual suggests. I hooked them up to my Jolida JD300B integrated which, as the name implies, is a SET that puts out 9 wpc via its 300B tubes. Volume wise, it sounded as if it were 200 wpc amp. Loads of sound easily filled the high-ceilinged room with glorious midrange, firm but somewhat rolled-off bass as 300B’s tend to sound and crisp mid highs with a bit more roll off at the very top. After several days and nights it was easy to conclude that the Jolida had never sounded this powerful and good. So I thought hmmm…wonder what the ‘ole Sonic Impact Super T amp would sound like with the SV’s. If you recall, the Super T is a Tripath based “digital” amp that puts out maybe 10 wpc. I hooked it up, let it run for about 30 minutes, turned out the lights and sat back listening to Reference Recording’s recent jazz quartet release of pianist Mike Garson entitle “Jazz Hat” (RR-114). It was the last thing in the player before I made the amp switch. Again I was stunned by the volume level achieved with the knob at only the 11 o’clock position. Since there’s not remote with the T, I had to run over and turn it down! Normally, the Super T would be run wide open or close to it. While the sound was much different, it still sounded amazingly good. I ended up playing about a dozen recordings that night from CD and SACD to LP’s. Gone was the tube glow and the seductive midrange, but bass w asmuch more extended and full with greater detail and transparency. While it was a more sterile and dry, still the sound was amazingly good, detailed and non-fatiguing. Like the Jolida, there was plenty of headroom with crackling dynamics. I estimated the levels topped out around 94 db with T cranked up to about 3 o’clock. Again as with the Jolida,, the Super T had never sounded so good. 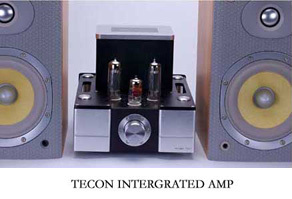 Then I remembered that I had a pint-sized integrated by Tecon Audio, the model 55, which uses two Chinese 6P14 output tubes, sometimes referred to as an "EL84 on steroids” to create an output of about 5 watts per channel of pure Class-A, um, power. In the review of the Tecon, I said after listening to the very dynamic Flim & the BB’s cut on the Stereomojo Evaluation Disk, “While the presentation was more than adequate, there is only so much limited watts can do. I got a good 80-85dB of volume with a little mild, soft saturation”. That was in the small room using small B&W monitors with efficiency rated at 90dB. Now I was listening to the same amp in the large room with four-feet-tall floorstanders with 12” woofers. Ok. You’re smart. You’ve read lots of reviews. What do you think I’m going to say next? Yep, the 5 watt Tecon sounded amazing with no strain while producing 90db levels in a room that is 24 x 22 with a ceiling that peaks at 12 feet. It is well known that single horn type speakers, even large ones, can be very efficient and can usually be driven by low watt amps, but surprise #2 is that these large three-way non-horn speakers can also be driven by SET types. Also interesting is the fact that the Coincident’s are rated only 2.5 db more efficient than the B&W’s used in the Tecon review, yet were superior in level of output. We have tested several speakers with similar efficiency ratings yet none of them produced the sound levels of the SV's with low-watt amps. How can that be? I asked Mr. Blume about this disparity and if he had an opinion on efficiency ratings. He answered, “Sensitivity ratings can be deceiving. Many manufacturers state their rating into 4 ohm, not 8 ohm loads. For example, a speaker that measures 92 db, into 8 ohms will be 95 db at 4 ohms. Others conduct their measurement at varying distances and not the standard one meter. Furthermore, while a speaker may have a specific sensitivity reading at 1khz, it may be much lower at the frequency extremes”. He went on to tell me that he has five criteria essential for speakers to achieve real efficiency which goes beyond a single nebulous dB rating. All five must be present. First, as he points out above, the published efficiency rating should be measured at 8 Ohms at one meter at one watt. (I would go further and say they should be measured over the full frequency spectrum). Second, there should be a uniform high impedance modulus or absolute value of a flat 8 ohms. Third, they must be electronically absolutely phase coherent. Another highly significant factor in allowing small tube amps to properly drive a speaker involves the manner in which the woofers are tuned. Since these aforementioned amps have very low damping factors (alternatively referred to as high output impedance) a speaker that has its woofers loosely tuned (meaning a high fb) will result in a loss of amplifier power attempting to control them. Conversely, speakers that have their woofers really well damped will be much easier to drive since the woofers require less amplifier power to control. Lastly, Blume believes that a speaker must have simple first order crossovers that do not rob amplifier power or reduce speaker sensitivity. We will leave it to you, dear reader, to judge if he is correct. But it is clear that when he states that the Coincident Super Victory can be driven by amplifiers with a minimum of 5 watts, he is not engaging in slick but deceptive marketing or hype. We are now up to surprise number four. That occurred one evening when Linda and I were entertaining another couple who are not audiophiles per se, but have a great love for music and have a sincere but not fanatical appreciation for good sound. They have a nice vinyl collection and a decent turntable that runs through a Linn integrated and AV123 Strata Mini speakers, all with which they are perfectly happy. And are not constantly searching for something to upgrade. That definitely precludes them from being audiophiles, doesn’t it? Of course, we were listening with the lights out and at one point Peggy asked if I could put on the Ellington “Blues In Orbit” LP I had played for them on previous visits. They have excellent taste in music, too. Since she was seated about two feet beyond the side of the right SV, I asked her if she wanted to move over to the sweet spot currently being occupied by her husband. “No thanks”, she smiled. “I can hear everything just fine over here”. I asked if she was sure because she was seated so far to the right. “Oh yeah. Everything is in perfect stereo even this far over”. I, of course, found this hard to believe so I asked if I could take her place for minute. She was right. There was a perfect left to right image with things in center actually in the center. But there was also front to back depth much like existed in the sweet spot. And that was surprise number 4. I had to take the picture you see to document it. Thus far, we’ve heard a lot about Israel Blume’s design philosophy and painstaking attention to detail and quality. As we know though, all that does not necessarily add up to a good speaker. So what does the Super Vic actually sound like? As I mentioned earlier, they sound good with a wide variety of amps, but everything changed when Blume sent me the newest version of his “Frankenstein” 300B monoblock amps that we will review separately later. But I will say that inserting them in the system triggered a quantum leap in sound quality. The rest of the review is based on the Frankensteins in place. We already know the soundstage is large and well defined. To me, one requirement for a speaker to be great is their ability to disappear, casting the illusion that the music is emanating from nothing. The SV’s accomplish this perfectly. 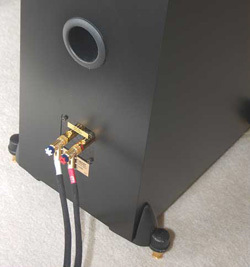 The fact that these narrow floorstanders image well is not unique and is common with speakers with a very narrow front baffle. It is to be expected. Coincident takes the extra step of beveling the fascia so that it is even more narrow, reducing reflections a bit further. Nice touch and an added expense. The presentation is both forward and laid back, depending exactly on how the source was recorded. On male and female vocals where the soloist is recorded way out front, that’s where they stood – suspended in front of the towers and usually well above them with the accompaniment well behind. On other recordings such as symphonic and well recorded jazz ensembles, the stage was recessed well in back in excellent front to back layers that often reached the top of the back wall. There was never a trace of beaming or sense that anything was jumping out boxes. There was also superb placement of instruments and voices within and throughout the image with exceptional space around them, particularly with the Coincident amps. Ambient cues and reverberation were in abundance and in proper scale. There was no sense of smearing or diffusion. Small and soft details like the rustle of brushes on a snare drum were easily discerned where with some other speakers they have been all but buried. However, at no time did I ever find myself thinking “Wow…listen to that detail!” Like live music, it was just there. Overall, the sound was relaxed but never dull or uninspiring. When the music was aggressive, the SV’s responded in kind, but not overly so. They seem to be genre neutral with no preference among hard rock, jazz, country, small or large scale classical or anything else I threw at them. They can be very warm and romantic as well as clean and cool, again depending on the music selection. If there was a gun to my head and I had to declare them either warm or cool, well, I guess I’d get some lead in my head. Personality was completely dependant on what was fed them, either via the electronics or the music. I found the Super Vic’s extraordinary in that regard. In preparation for a never before attempted review project, I have been accumulating different brands of 300B tubes with the goal of doing a blind shootout among them. With the arrival of the SV’s and the Frankensteins, I knew I had the right pieces in place to execute it. And we did. Hearing the differences between the many different brands was easy, almost to the point I felt as if the system was telling me in words what I should write down. I believe this is primarily due to Blume’s diligence in reducing and controlling resonance at even the most insignificant levels and the first order harmonic design he employs. In terms of cohesiveness and linearity – a speaker’s ability to reproduce frequencies evenly throughout the spectrum without abrupt and significant dips or peaks – the SV is exemplary. This is probably due to his minimalist crossover implementation and the quality of the drivers he chose. The less coloration the speaker imposes on the music, the more the speaker is able to pass the music to your ears with a high degree of truth. I mentioned that I hooked the SV’s up to the new Spectron Class D monoblocks (Musician III version 2) that put out 2,000 wpc. We have seen that the SV’s will play at moderately loud levels with minimum power. But will they really play LOUD? I’ve found that through years of experience, I can usually gage sound levels within a db or two without a meter, but this time I used my Rat Shack meter to record sustained levels at 99 to 100 db with peaks above 110. I never listen that loud and kept that test short at about 5 minutes. Other than The Who in the 70’s, those levels qualify in anyone’s book as LOUD, I think. While I did not hear clipping or high degrees of distortion (nor smoke or explosions), there was a sense that the speakers were on the EDGE of strain and that I probably shouldn’t push them much higher. Or maybe that was ears. Either way, I surmise that the SV will play at levels most people (and most neighbors) would judge as insane. There are certainly speakers that will comfortably play as loud or louder (The ATC and ZU lines come to mind to mention a couple). If you normally play your system that loud, look elsewhere. Dynamics is a term that also describes loudness but in a very short time interval – sometimes microseconds. It can apply to a sudden crash or “hit” by a small ensemble, a large orchestra or a single staccato or sfz (Sforzando) note. But dynamics can also apply to very soft notes or passages. In musical notation, we use <p> for soft and <f> for loud, short for “piano” and “forte”. The instrument we know as the piano today was originally called the “pianoforte” or “softloud” because its newly invented hammer action could strike a string very softly or loudly depending on how hard and at what velocity the pianist played the key. Previously, keyboards like the harpsichord used a plucking mechanism that was either on or off. No dynamics at all. Each note was the same volume no matter how hard the key was depressed. Harpsichordists eventually achieved dynamics by employing two keyboards, one louder than the other, but each still limited to one level. This was called “terrace dynamics”. In audio, the question always is how well and accurately a speaker or component reproduces the sudden “soft/loud”, whether violently sudden or over a longer time such as a phrase. The Coincident Super Victory does a very good job in this respect, probably better than most and not far from the very best. If there are any shortcomings, for some people it may be in the bass. I stated that in the small room, bass was robust but not overwhelming in a small volume area. The SV’s were the largest speaker ever to “work” there. In the large room, bass was adequate; firm and fast with good extension to the nether regions. I used the SV’s to write a comparison review of three CD’s by Stanley Clarke, Marcus Miller and Victor Wooten – top bass players all. (A link is found at the end of this review) Needless to say, there was plenty of subterranean frequencies found there, and they were faithfully reproduced. However, as opposed to the smaller room and though I moved the towers around until I found the best result, it is fair to say that the low end is not going to frighten, shock or jolt most folks. It never made anything in the room rattle. Only one speaker has done that to this point and that would be the Proclaim DMT-100’s that are under review (we have the only review pair in existence) that put out a phenomenal amount of bass energy. But then they are $26K per pair. The next model up in the Coincident line, the aforementioned Total Victory IV, introduces a second woofer to increase the amount of air moved as well as a bit lower extension. I think perhaps those would be a better match for my room. Hopefully Mr. Blume at some point will let me find that out. Let me stress that in my case, it is not a matter of inadequate bass response in terms of “lowness” or accuracy with the SV’s, it is more a pressurization issue. In addition to being a rather large room in terms of cubic volume, it opens up at the left rear to another large room – it is not a sealed box. I think most people, even in moderately large rooms, say around 3,000 cubic feet, will find the bass totally satisfying, but we all know there are those who have to feel bass impact in their guts and frighten small animals to be happy. That probably won’t happen in rooms much above 3K cubes. Again though, in rooms around 12x12x10 or smaller, the bass may well rattle a CD case or two with appropriate material. Size matters. That’s why Coincident makes two larger speakers. Some people say there is no such thing as a coincidence. Everything means something. Therefore the fact that “coincidence” and “Coincident's” sound the same but are spelled differently must have some deep, metaphysical significance. I think they are just homonyms like “to”, “too” and “two”. However, when coincidences start to accumulate, I tend to try to connect the dots. In this case, after spending time with Israel Blume, hearing his philosophy for speaker building and then experiencing that what he has said, even though a bit dramatic, is not just hype but works in actual practice, I’ve become a believer. Especially after he told me this: “We have been able to flourish in a very competitive industry against mega conglomerates with very deep pockets because we provide audio components that are built with quality not profit as our driving motive.” While that statement on its own means little, I believe his deeds match his words, and with that statement, Mr. Blume and Stereomojo have something very important in common. I know that one other publisher, Arthur Salvatore over at high-endaudio.com who, based on what he has written, is a very honest, unbiased reviewer. I hear he is a big fan of Israel Blume and Coincident. I know that because several of our readers who are also fans of Arthur’s have written us asking when this review will be published and mentioning Arthur’s opinions on other Coincident products. It also appears he is not a big fan of Stereophile and TAS, so we that have in common, too. You should check out his site. 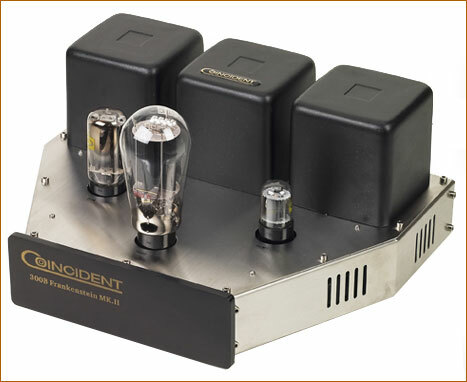 The Coincident Super Victory’s are extraordinary in some areas such as their ability to play at significant levels with very low output amplifiers such as SET’s and their uncanny ability to sound very good with many types of amplification without being “forgiving” or compromising the sound quality. Their ability to let the listener hear minute differences in source components as well as recordings is also remarkable. Purity of tone is also a highlight. They do not seem to favor any particular musical genre and excel at neutrality, being neither warm or cool on their own, but revealing such with source material. Being towers with 12” woofers yet still able to be used in small rooms down to 10x10 is unique. The fact that positioning of the towers with either the woofer side in or out gives an extra bit of bass control not found in many other designs, though it isn’t exactly rare. Downsides? The SV’s do not have speaker grills, so the drivers in front and on the side are always visible. They are limited to three standard colors; black, natural cherry and red cherry. Actually, that's not much of a limit and if you want any other finish, Coincident can do almost anything you can imagine - for an extra cost of course. If you have a room with considerable volume as suggested above and prefer bass that mimics a disco, you might want to look elsewhere or move up in the Coincident line. If your definition of “musical and accurate” includes a bright, etched in glass sound with instruments and voices vividly spotlit, these won’t tingle your ears. Also, if your taste slants to the other extreme of ultra warm, lush and romantic, even tube amps will not force these to comply. If you do prefer the tube sound and low-power SET’s in particular, we think you should seek out an audition forthwith. 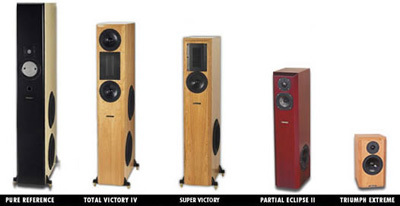 Even if the Super Victory's sonic qualities were just a little above average, the fact that they are a full range speaker that do not suffer the inadequacies of other speakers that are super efficient (such as single horn drivers) and cost less than most horn speakers such as Acapella, Azzolina and Avantgarde, they would deserve a our Maximum Mojo Award. Throw in the fact that they also are not afflicted with a very narrow sweet spot as the others just mentioned just adds to the picture. The other sonic qualities we observed are icing on a very tasty cake. These will certainly be in the running for our 2008 Product of the Year.